Daniel Hannan: That Brexit film works as drama. But it doesn’t as history. I should know. I was there. CCHQ looks to bring Elliott inside the tent – but in what capacity? Matthew Elliott is Campaign Director of No2AV. Happy Australia Day to any Aussie readers! While it might seem strange to drag the issue of the UK's forthcoming referendum on the Alternative Vote into the national day of our friends Down Under, Australia's experience of AV has become a regular talking point for both the NO and Yes to AV campaigns. The Yes camp's use of Oz as an example of a mainstream country using AV is understandable given that their only other options are Fiji and Papua New Guinea. But the reasons for the NO to AV campaign referring to the Australia experience are not so immediately obvious. 1. Six out of ten Australians want to return to First Past the Post. 2. In Australia turnout declined after the introduction of AV, leading to compulsory voting laws. We know the Yes campaign have a challenge in trying to explain the complexity of the Alternative Vote. But that challenge ought to also be a worry to people who are concerned by Britain's falling voter turnout. According to a report by the Australian Electoral Commission, ‘The significant impetus for compulsory voting at federal elections appears to have been a decline in turnout from more than 71% at the 1919 election to less than 60% at the 1922 election.’ What happened in between these elections? The introduction of AV. 3. Australia experiences levels of spoiled ballots five times higher than the UK, disenfranchising less affluent, less educated and older voters. Following on from my point above, a complex voting system also leads to a higher rate of invalid votes cast. In 2010, 5.6% of all Australian ballots were spoiled, as opposed to less than 1% in the UK’s general election. A study from Australia suggests that less affluent, less educated and older voters are more likely to make a mistake on complicated AV ballots and have them thrown out, removing their voice from the political process altogether. 4. In the hands of an extremist party, AV becomes a weapon to punish or pressure mainstream parties. The far-right One Nation party used AV to ‘destroy’ moderate candidates by tactically directing its preferences against different parties in different seats. In Australia the One Nation party had significant electoral success under AV, gaining 11 out of 89 seats in 1998 in Queensland’s state legislature. 5. Candidates who come in first can end up losing. As an extreme example, in 1980 an Australian Labor Party candidate lost the Riverina seat despite having the support of 46.9% of the electorate on first preferences. And the candidate who came third can even win – in the most recent Australian election, for example, Andrew Wilkie won the Denison seat after coming behind both Labor and the Liberals on the first ballot. 6. Australian politicians use ‘How to Vote’ cards to tell people how to vote. Most people don’t have strong preferences for their fourth, fifth or sixth choice candidate. 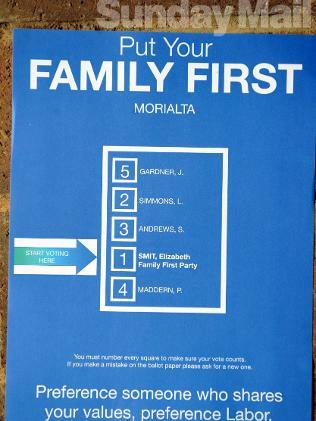 In Australia political parties exploit this by issuing ‘How to vote’ cards (see here for an example), instructing supporters on the exact order in which they should list their preferences. Most voters follow these cards, which gives political parties even greater power and leads to ‘drone voting’. According to the Australian Election Study, 55% of voters admit to following the card, and many more are undoubtedly influenced by their party’s recommendations. 7. Australia’s last election took 17 days to be resolved. Australia’s general election took place on 21 August 2010, but the government was not formed until 7 September. Contrast this with the campaign run by ConservativeHome to make sure we knew who had won the UK General Election the day after we voted. 8. Australia introduced AV for crass political reasons: To ensure a permanent electoral pact between two parties. The Nationalist Party introduced AV after it lost the seat of Swan – an 18-year Nationalist stronghold – in a 1918 by-election because conservative voters split between the Country and Nationalist Party candidates. Labor’s 21 year-old candidate won with 34% of the vote while the right-wing candidates got 30% each. The next by-election, held under AV, saw a Labor candidate lose despite getting 43% of the first preference votes, and the subsequent general election in 1919 led to the permanent electoral pact between the Country Party and the Nationalist Party. Whatever your feelings about the politics of Australia, I would imagine only a small minority of readers want to see a formal pact between the Conservatives and the Liberal Democrats in Britain. And regardless, it is in no-one's interest to have one political party decide an electoral system for their own political gains (as the January issue of Parliamentary Affairs makes clear) - or as David Laws so eloquently put it on these very pages "a shield against the loss of popularity that we [the Lib Dems] would suffer." And we mustn't let them. Vote NO to AV on 5 May.